The ocean is taboo during monsoon season. The fisherman are not allowed to go out and fish for two months during the monsoon. This allows for the fisheries to replenish and also because the seas are very rough compared to other months. It is said many tourists drown here each year and hence this perpetuates the myth. I wonder if it is that many of the tourists that visit here may not be strong swimmers to begin with or perhaps they indulge in a few too many Kingfishers? Originally when we had planned to travel to Goa it was purely to practice the yoga with Rolf and Marci and have the chance to explore India again. 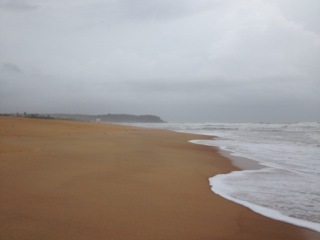 I had always seen photos of Goan beaches and the water has always been flat as a pancake. I thought I would look into it and low and behold I was finding that there is surf in Goa! Just my luck this only happens during monsoon season and guess what, Virgin Atlantic allows you to bring a surfboard for free(completely unheard of)!?! So of course now I am traveling to India with a surfboard! When we arrived my board got left behind in London and at that point I thought my chances of seeing it again were pretty slim. We are staying about 500 meters from the beach and as soon as we got settled we went down to the beach and it was a solid 4-5 foot and offshore winds and I thought I had stumbled upon a hidden gem. 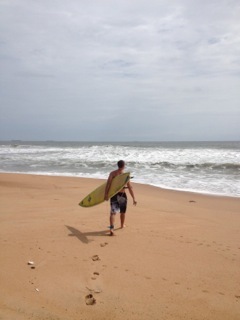 To my amazement the next day my board arrived, but so did the rains and onshore winds. Each day for the past week I have been checking the waves religiously and it has been one big washing machine, close out, mush ball, onshore surf session after another. To add to it, upon arrival I have had so many people tell me that the ocean is so dangerous and don’t go out in the waves. All I have heard is this person has drown and that person never came back and and watching this big soupy mess made me think there might be sea dragons living out there! To me the waves look just like at home with a solid swell and to be honest not that big of a deal. The stories however just never let up. One morning when I was feeling very hopeful I walked down with my board under arm and when I saw the conditions I was completely uninspired. Again, big, messy surf and to add to it I am the only lonely surfer on this entire stretch. All the locals hang out on the beach but no one ever goes swimming. So I decided well at least if I am going to go out it needs to be decent. When I was walking back an Indian woman said “did you go out in the water?” I replied “no” and once again came another story! The only catch here is I have felt this before. When I was in Indonesia on a surf trip to Bali and surfing waves of so much more extreme consequence I was told to never wear green in the water! If you wear green it is very bad luck and to ocean gods will do you in. There is also this thing called superstition. I am not one to give in to superstition. Yet when a whole culture believes it to be true it really gets you thinking. There is also the opposing side that says live in the moment and experience this reality. Tourists here come to party and end up being completely disrespectful to the local community. What it boils down to is this is not a surfing culture! So here comes American guy with surfboard under arm and heading down to go “monsoon surfing”! The last three days the sun has come out and the weather has been spectacular. What a difference. I have never seen rain like this in my life and then to have it turn back around to beautiful sunny skies…there is hope! After practice with Rolf in the morning I went down to the beach again and I knew that today was going to be the day I was going to go for it. The waves were still mushy from the onshore wind and they were only about head high out the back so it seemed reasonable. 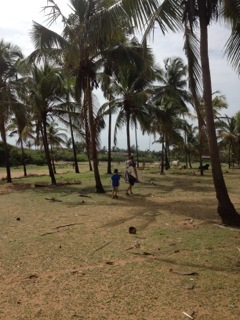 Tam and Ethan followed me down there and we walked past another heard of cows hanging out under the coconut palm trees on the way. The life guard shack was open about 800 meters down the beach and they had the red flags up along the beach so I knew I better get in quick before someone came up to me and said I wasn’t allowed in the water. I jumped in and began to paddle out. The set up is a classic victory at sea beach break, wave after wave of whitewater, duck dive after duck dive to try to make it out. I seemed to be paddling in place and in no time at all I heard the whistle blow and and turned to see the lifeguard waving me in. I took my moment and turned, caught a wave and rode it up onto the shore. I ran up to him and to my surprise he changed his mind and said all was o.k. for me to continue. I must have passed the test and went back out! 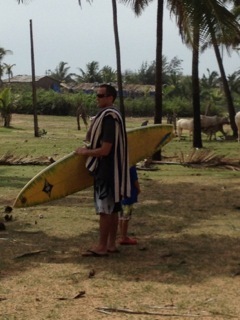 Finally, I had my first surf session in India! Sloppy and messy yes, but so much fun. It felt so good to be in the warm water and I feel I was probably the only one surfing for miles! To me, yoga is surfing and surfing is yoga. Merging these two wonderful arts into this travel experience makes me so thankful to be alive! !